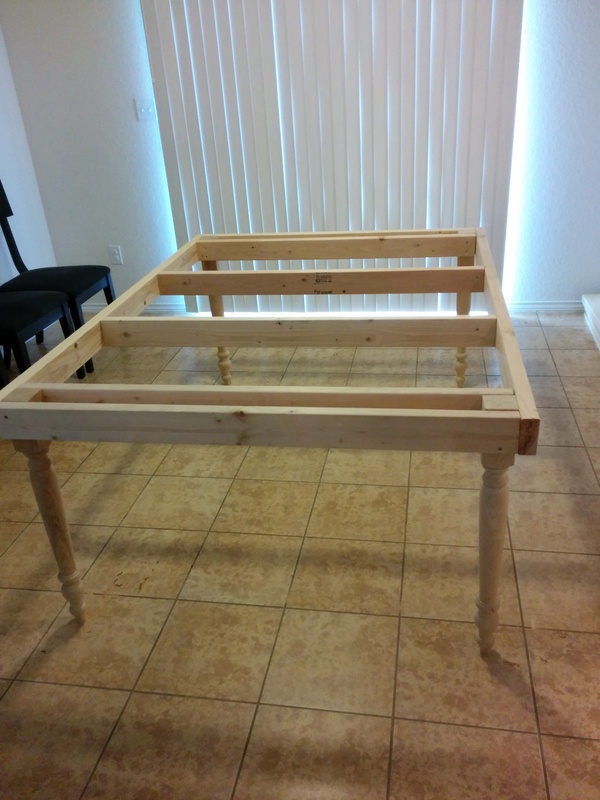 I wasn’t quite happy with our old table so I decided to build a new one. I looked around and decided to build a “farmhouse table”. I looked at over a dozen designs and tutorials from websites like Ana-White.com and YouTube. Step 2. 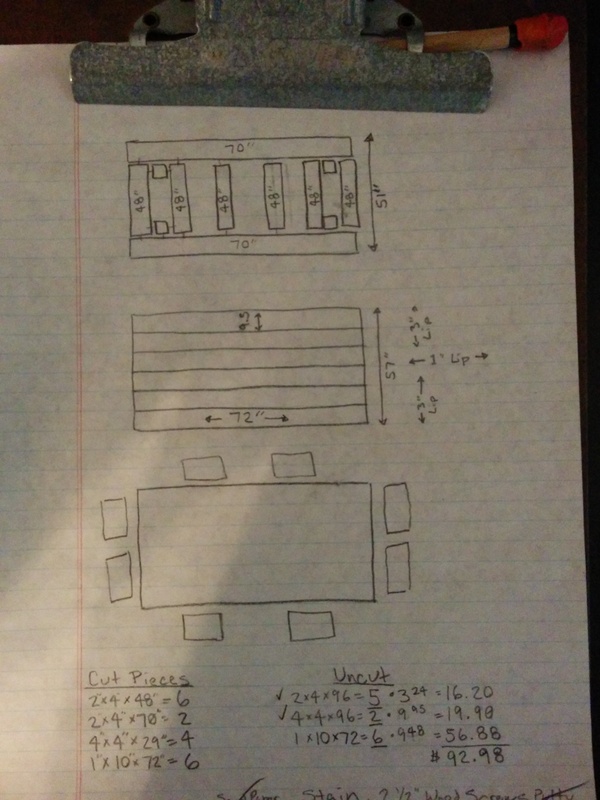 Draw up a plan. 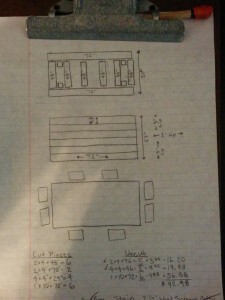 So I didn’t go with a pre-made plan but bits and pieces of other plans make up what mine ended up being. 3. Buy the lumber. I went to Lowes for the lumber and had them cut all the lumber. 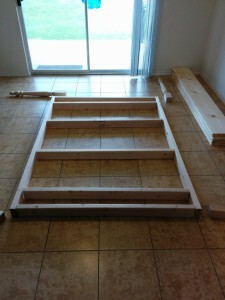 I had the number of pieces and lengths planed ahead to make the task easy. One Newb mistake I made was not realizing that they did not cut 4×4’s. I ended up going over budget by choosing turned legs as replacements but I have to admit they do look better. 4. 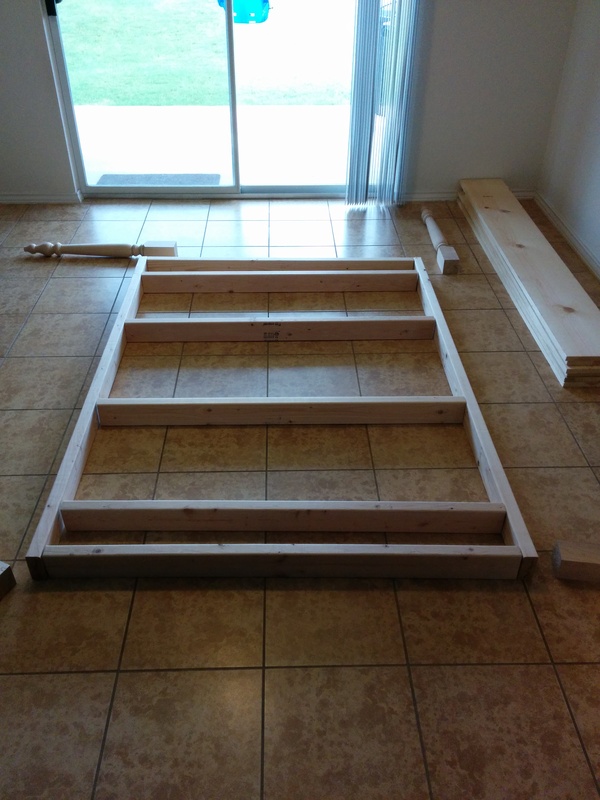 I laid all the lumber out in the kitchen to build the table. It’s hot in Texas this time of year. I wasn’t going to hang out in the garage that long. Sarah took Joseph to the zoo and then the mall so that I could have the space to myself. 5. 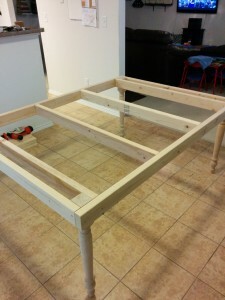 After building the frame of the table I turned it upright and placed the boards for the top on. I just screwed the boards down and made sure to countersink the screws. I then placed wood filler in the holes and let that dry for a few hours. 6. 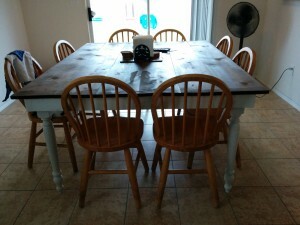 Later in the evening I painted the legs white and stained the table top. I turned on some fans to help get some air movement to dry out the project. 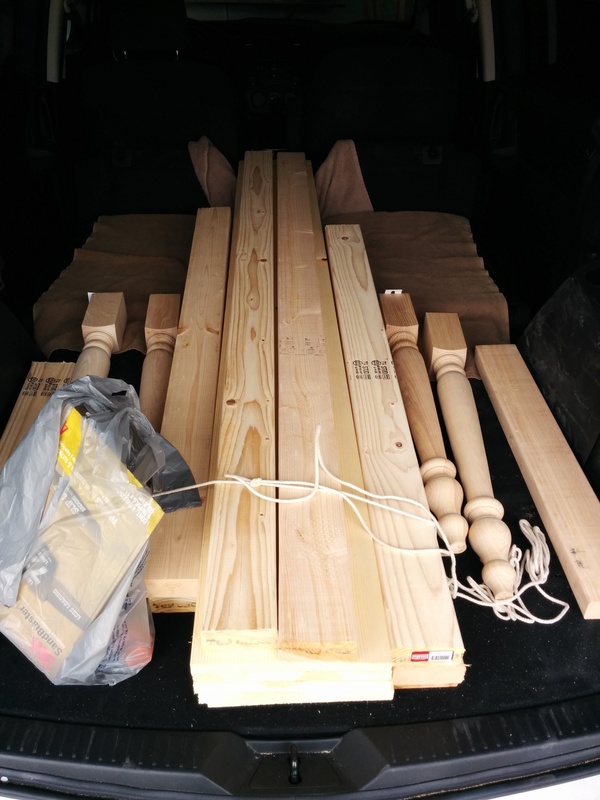 Friday night I called about some wood chairs advertised on Craigslist. I ran out to Boerne on Saturday morning to pick them up. 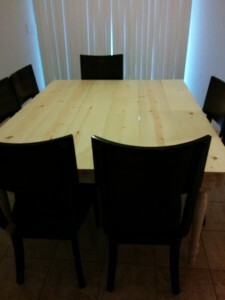 I also placed our old dining table on Craigslist and had a buyer by Saturday morning. They stopped by Saturday evening to pick it up. It can be a little weird buying/selling something to a complete stranger on Craigslist. Luckily this is Texas so I was discreetly armed and aware each time and luckily the weapon wasn’t needed. They were really nice each time. I’ve had a few people that seemed pretty sketchy in the past. 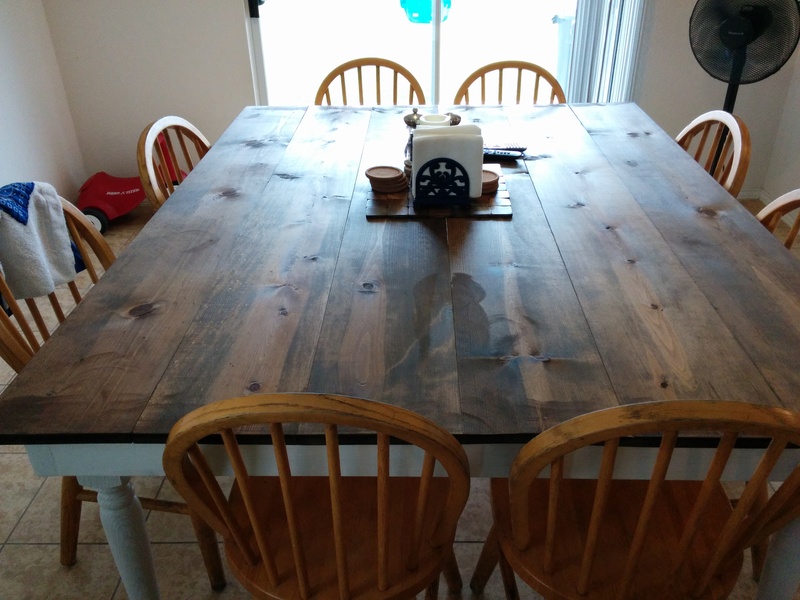 Overall I’m pretty happy with how the table turned out. 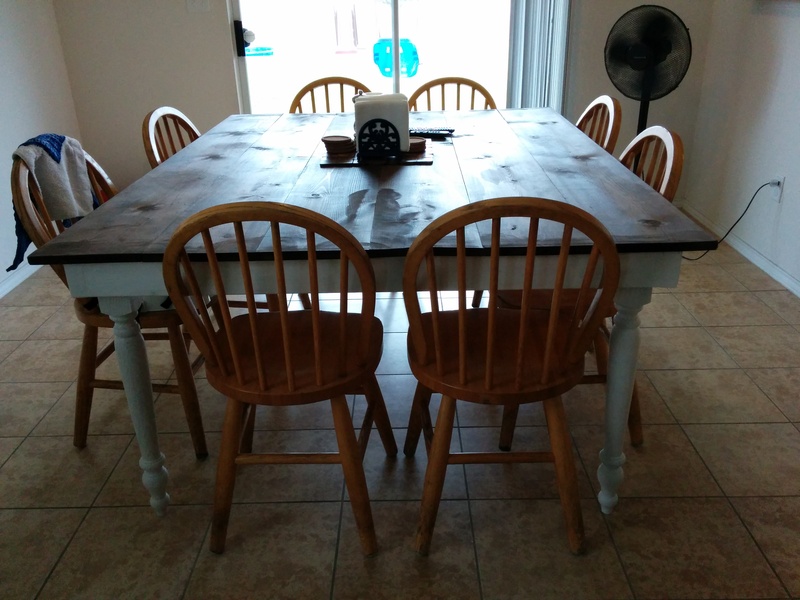 My next big project will be sanding and painting the chairs. We are planning on painting them green to be a bright match to an accent color that is in our downstairs area.